I'm in the middle of slapping together an entry for Classic-Castle's sixth annual Colossal Castle contest. Colossal Castle Contest VI has 11 categories with sets as prizes and I've got my eye on the "Haunted Castle," vignette- where you're asked to create a haunted castle building or room. I'm playing around with different surprises and one of the elements I think could be neat is pictured to the left. 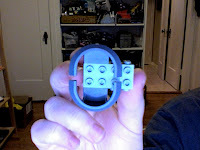 It is two wheel rims that have been attached to a Technic brick. I think it resembles the old oval portrait frames and might add something different to one of the walls inside my castle vignette. I could see a 2x2 brick with a sticker or several 1x1 rounds adding an image inside the "frame." The entries are due next Wednesday and it's time to find a place for my glow-in-the-dark ghost. Check out my use of your pictured technique on my 'HALO Scorpion Tank' I built for the MOCOlympics. I think the fourth picture down shows it best. I love that technique! Using it as a oval picture frame is brilliant!